Alfred's life is going nowhere fast. He's a high-school dropout working at a grocery store. His best friend is drifting behind a haze of drugs and violence, and now some street punks are harassing him for something he didn't do. 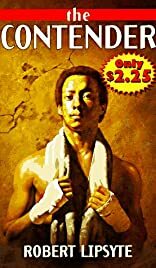 Feeling powerless and afraid, Alfred gathers up the courage to visit Donatelli's Gym, the neighborhood's boxing club. He wants to be a champion--on the streets and in his own life. Alfred doesn't quite understand when Mr. Donatelli tells him, "It's the climbing that makes the man. Getting to the top is an extra reward." In the end, he learns that a winner isn't necessarily the one standing when the fight is over. Teens and adults alike will be knocked out by this powerful story of how a frightened boy becomes a man. About Robert Lipsyte (Author) : Robert Lipsyte is a published author of children's books and young adult books. Some of the published credits of Robert Lipsyte include Yellow Flag, Raiders Night.